For those of us in the northern states, getting through the winter is dependent on getting our cars through the winter. Snow, salt, cold starts, low visibility and slippery streets all contribute to winter automobile problems. If you care for your car, you can help it make it to Spring in good condition by following these basic maintenance procedures, and using top quality car care products, all winter long. Most of them can be performed by any driver but if you're hesitant to open the hood, find a good mechanic to do them for you. Start by opening the hood. First step is to check the fluids. Check the oil, transmission, radiator coolant, brake, power steering and windshield washer fluids regularly. If your climate is extremely cold, switch to a winter weight oil and a windshield washer fluid with extra de-icing. 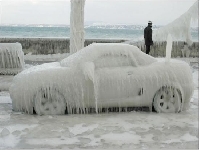 Check the radiator coolant or anti-freeze with a tester - it's usually good for up to five years. If necessary, flush the radiator and refill it with a good brand of coolant. Next, check the hoses for leaks - fresh coolant won't help if it's leaking out. Tighten clamps and replace cracked hoses. Inspect the belts - tighten if they're loose and replace if cracked. Clean the battery terminals of any corrosion and check the battery's charging ability - many auto parts stores have free testers. If your battery isn't holding a charge, don't hesitate to replace it - it will keep you from freezing on the side of the road and spending even more on towing charges. If your car has spark plugs, inspect and test them and replace if necessary. Next, move to the outside. Inspect your tires regularly. Make sure they're inflated to the proper pressure and have good tread. Check the windshield wipers for cracks, wear or loose fit in the holders and replace them if necessary. Even if they're in good shape, clean them frequently to insure they don't streak your windows. Keep your windows cleaned and consider applying a dirt and film repellant. Check your headlights and taillights regularly to make sure they�re all working and pointed properly. Clean off the headlights with window cleaner and when they're dry, rub some car wax on them. It will keep ice and dirt from building up on them. To protect your car's finish in the winter, give it a good coat of wax and wash it frequently. Keep plenty of brushes, scrapers and rags in your car for cleaning off snow, ice and dirt before driving. If you have good visibility, good tires and good brakes, you�ll be able to avoid accidents in hazardous conditions. Don't forget to check underneath your car. Make sure the muffler and exhaust system are attached properly, along with other protective pans and covers. Look for leaks and take care of them immediately. Inspect the brake pads or better yet, have them inspected by a mechanic. To protect the undercarriage from rust, spray it when you wash your car or go to a car wash that has an undercarriage washer. This may sound like a lot to do, if you care for your car all winter long, you'll make it safely to spring, protect your major investment and look good when it's time to cruise in the warm weather.